Chelsea "categorically refute" FIFA's findings that they breached rules on the registration of minors and plan to appeal against the transfer ban and fine imposed on them, the club have announced. Chelsea have been handed a two-transfer window ban by FIFA for breaching transfer rules around the signing of minors. Chelsea and the Football Association have been sanctioned by FIFA's disciplinary committee for breaching regulations over the transfer of minors, the world governing body has announced. The Blues have been banned from registering players for two consecutive transfer windows for 29 incidences of breaching article 19, which relates to the transfer of players aged under 18. The London club were also fined 600,000 Swiss francs (over £460,000), while the FA has been fined 510,000 Swiss francs (over £390,000) for breaching the rules in connection with minors. 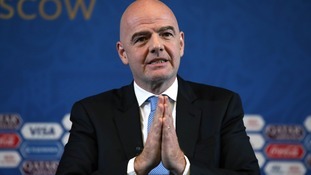 Fifa president Gianni Infantino will be the only name on the ballot paper when the 211 member associations meet in Paris. Gianni Infantino says spreading matches at the 2022 World Cup in Qatar to neighbouring countries could help bring peace to the Middle East. Former Holland manager and striker Marco Van Basten has quit his role as FIFA's chief technical development officer, claiming he wants to spend more time with his family. The 53-year-old, who enjoyed a glittering playing career with Ajax and AC Milan before moving into coaching, joined FIFA's technical team in 2016. Van Basten was one of FIFA's key advocates for video assistant referees but he had less success with ideas for several radical changes to the game's laws. These included scrapping extra-time and offside, sin bins instead of yellow cards and ice hockey-style one-on-ones instead of penalties. In a statement, Van Basten said: "After two good and interesting years I decided to put an end to my duty at FIFA, mainly to be able to spend more time with my family in Amsterdam. "I learned a lot being in a position to influence this game from the other side. The World Cup in Russia with the introduction of VAR was a nice milestone." FIFA's deputy general secretary Zvonimir Boban thanked Van Basten for his work in "reconnecting the institution with its technical community" and wished the Dutchman all the best for the future, which may include future projects with FIFA. FIFA is set to publish the last piece of work that Van Basten oversaw, the technical report on tactics at the World Cup this summer, on Tuesday. England captain Harry Kane has been shortlisted for the Fifa Men's Player 2018, along with Cristiano Ronaldo and Lionel Messi.